Shortly after moving to Malaysia we fell under the spell of all things putu. Call it research (we're food 'documentarians', after all) or call it a quest for the best, but we are physically unable to pass a putu stall without stopping. 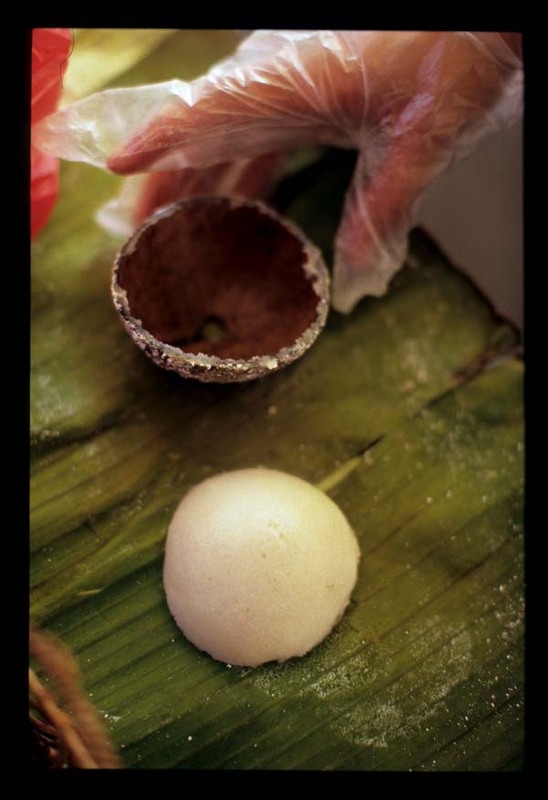 Putu - steamed rice cakes, broadly defined - are God's gift to rice-inclined (and wheat disinclined) fans of dough treats, and they are thick on the ground in Malaysia, Indonesia, Sri Lanka, India, and the Philippines (it's been suggested that they originated in southern India). They aren't always sweet, and they assume innumerable shapes, colors, and textures, depending on what they're steamed in, what they're filled with (if anything), and what is - or isn't - mixed with the rice flour they're made from. This rice puto stall at the Quezon City (Manila) Sunday Lung Center market (the final 'u' is replaced with an 'o' in Tagalog) specializes in makapuno puto, that is, puto made with the fruit of the makapuno coconut palm. 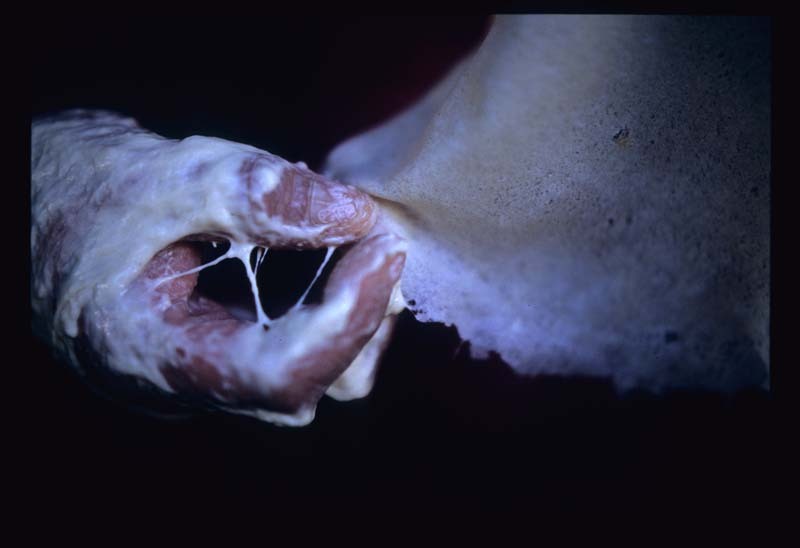 Makapuno coconut flesh has been described as slightly 'glutinous'. 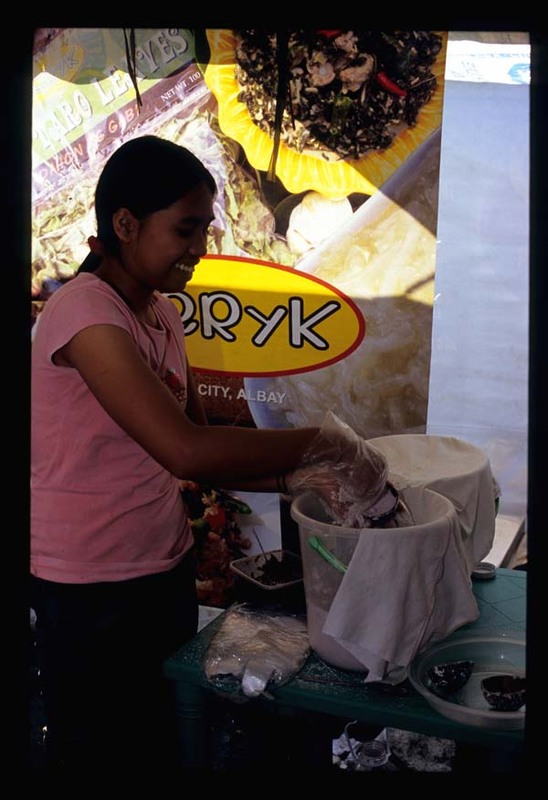 In the Philippines it's often used to make ice cream and preserves. 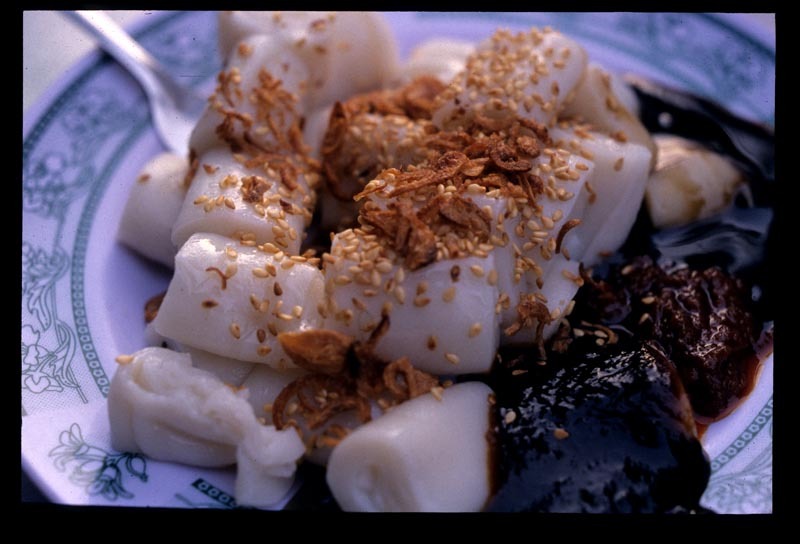 Unlike Malaysian putu, these rice flour cakes are cooked not in stainless steel molds, but in coconut shells. The rice flour is packed directly into the shell, with no cheesecloth liner. 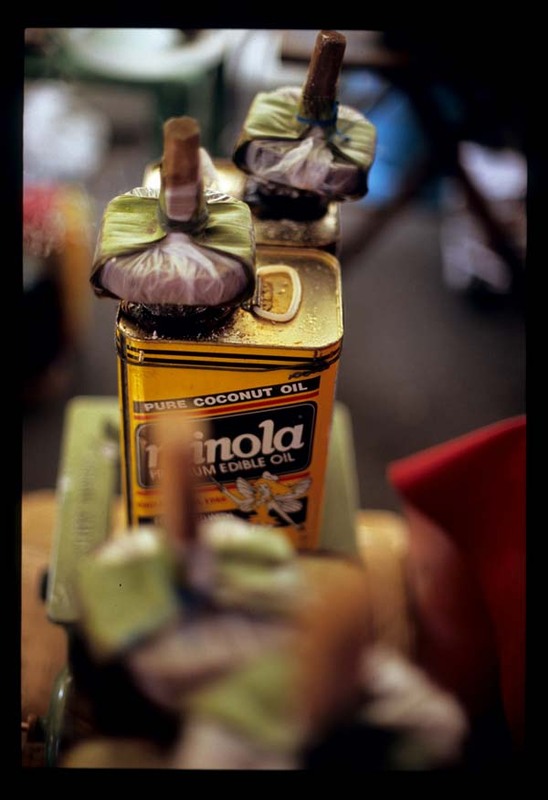 These colorful, ingenious steamers are made from coconut oil cans. The cans are filled with water and placed over a gas burner. 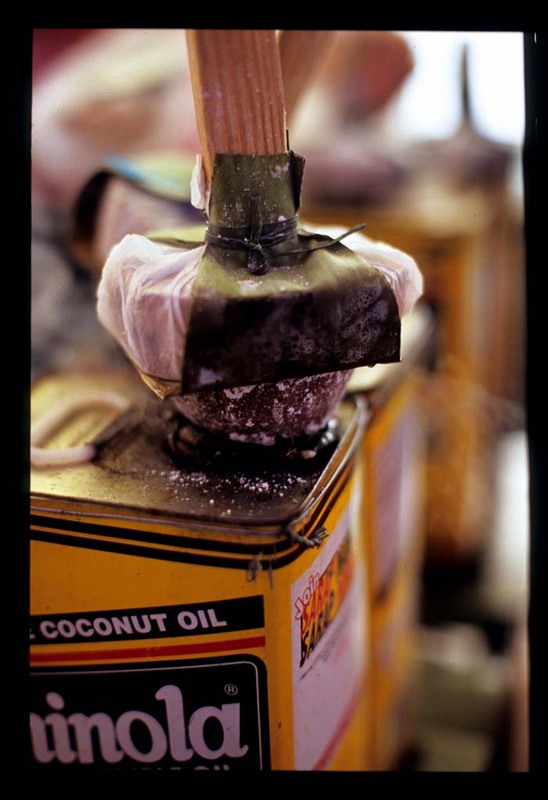 Once filled with rice flour the coconut shell half (a small hole is cut into its bottom) is set on the can's opening. A banana leaf-wrapped weight, placed over the mouth of the coconut 'bowl', is the steamer's 'lid'. After about five minutes of steaming the rice flour-makapuno dough has come together in a mass and is ready to be unmolded. As much as we loved observing the process, we weren't exactly crazy about these puto. They're texturally quite interesting - the makapuno mixed in with the rice flour lends a certain amount of chewiness - but, as certified palm sugar lovers we missed the smoky sweetness of the sugar-boosted Malay-Indonesian and Indian versions. No matter. The world of the Philippine puto is large and, for us, largely uncharted. Future trips to the archipelago nation will no doubt yield worthy finds. The words 'Southeast Asian wet market' bring to mind images of bounty - heaps of gorgeous fresh vegetables, showy mounds of extravagantly colored fruit, the glint of sun off the scales of dozens of varieties of fish. 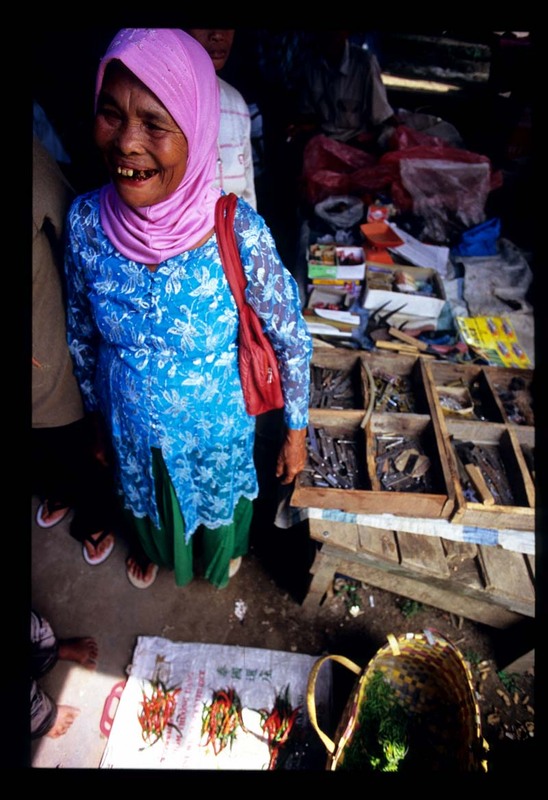 We find the opposite at this weekly market in western Sumatra, about thirty kilometers south of the Aceh border. Though it's lively in the way that once-a-week markets are, the selection of produce is limited. Stall after stall of dried fish is a testament to the local standard of living. Fresh fish and vegetables are expensive, dried fish can stretch a meal among family members and over days. 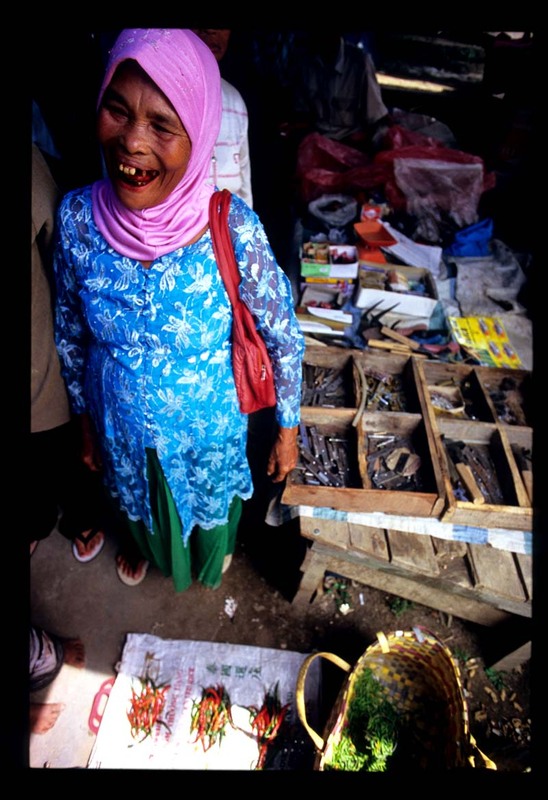 This woman sells cabe, or chilies. Tiga tumpuk - three piles - of cabe, to be exact (the chilies in the basket are another vendor's and she's selling the stink beans in front of her chilies for a neighbor). Each tumpuk sells for 2,000 rupiah (foreigner's price? ), or less than 25 cents. 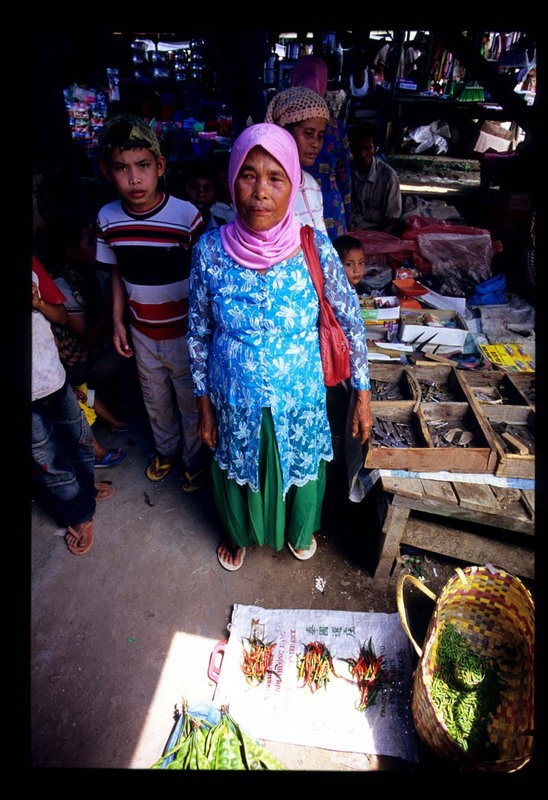 She grows them in her garden and makes the trek to this market every week to sell her 'harvest', rarely more than five tumpuk in total. 'They're good chilies! Very hot,' she assures us. And agrees to pose with her produce. Catcalls ensue immediately. 'Look pretty! Smile! You're going to be on TV!' Most of the hecklers are young male CD vendors with outrageous haircuts. She doesn't know what to make of it, at first. But then she gets into the swing. We're on the road and have no kitchen, but buy two tumpuk anyway. It's the least we can do, for a smile like that. Steven eyes his watch. His demeanor, always genial, becomes decidedly more so as a white van with the words 'Kein Ayam Itik Mee Telur' stenciled on its sides comes into view. The fresh egg noodles have arrived. Crisis averted. It's 6:05 on a wet Wednesday morning. 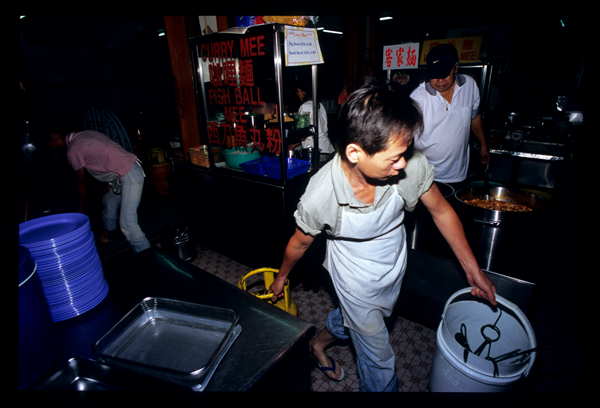 Ninety minutes earlier Steven guided his black Harrier to a space in front of Restoran Hong Seng and, with wife Oiling and helper, unloaded its contents: unwieldy stainless steel pots, a family-size Coleman cooler, bulging plastic bags. The first customers wouldn't arrive for at least an hour, but there was soup to simmer, lettuce and bean sprouts to wash, wonton to stuff, and meat balls to boil. Then there were kalamansi to halve, sambal to spoon into saucers, green onions and long beans to arrange in the display case, tofu puffs to snip, coconut milk to stir into the curry. Steven's Section 17 stall is known for wonton filled with prawns so fresh they sing of the sea and a curry noodle that, according to one fan, is 'not too spicy, not too rich - just right.' He and Oiling plunged into the world of food hawkerdom eight years ago, selling first from Kedai Kopi Wah Cheong and then, after a break in New Zealand, moving next door to Hong Seng. The coffee shop's vendors are rarely idle, but it Steven and Oiling's stall that consistently sells out and shuts earliest, often before lunch on weekdays and by 10:30 or 11am on weekends. But lest you envy a schedule that appears to allow plenty of time for repose, know that the couple's day begins while most of us are still tucked into our beds and doesn't end until we're just sitting down to dinner. This morning, as usual, they rose early enough to arrive at the Old Klang Road market by 4am. There, they purchased santan (coconut milk) and other ingredients, then returned home to prepare everything for transport to the coffee shop. Wouldn't it be easier to do all that shopping the prior afternoon? Wouldn't it be nice to get an extra hour or two of sleep? Extreme attention to detail makes for a load of work. Once the stall closes there's washing up to do and pots to load into the Harrier, and then it's back home to prepare the next day's meals. Steven could buy prepared curry paste. 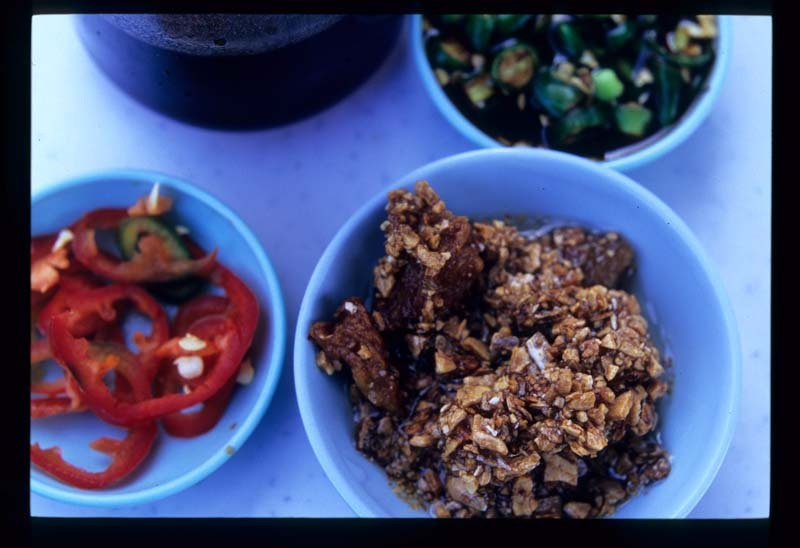 Instead he makes it from scratch, softening dried chilies in boiling water, stripping them of their seeds, boiling them again, and then grinding them - along with galangal, lemongrass, turmeric, candle nuts, and curry leaves - to a paste. In the meantime he's prepared a clear soup from chicken and ikan bilis. Some of the broth takes the paste, and the mixture is left to simmer for ten hours. Now he turns his attention to the prawns he sources from a Sekinchan supplier ('You just can't find tasty prawns at the market. '), which he'll peel and toss with a wee bit of sugar (to preserve their 'bounce') before depositing them in the fridge. 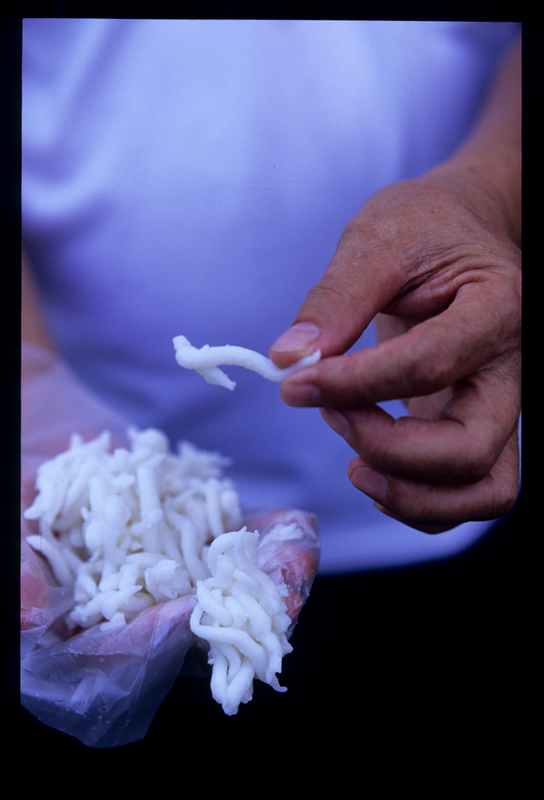 Then there's the loh see fun ('rat tail' noodles). Steven can't abide the commercial versions, laced as they are with preservatives and slick with oil. 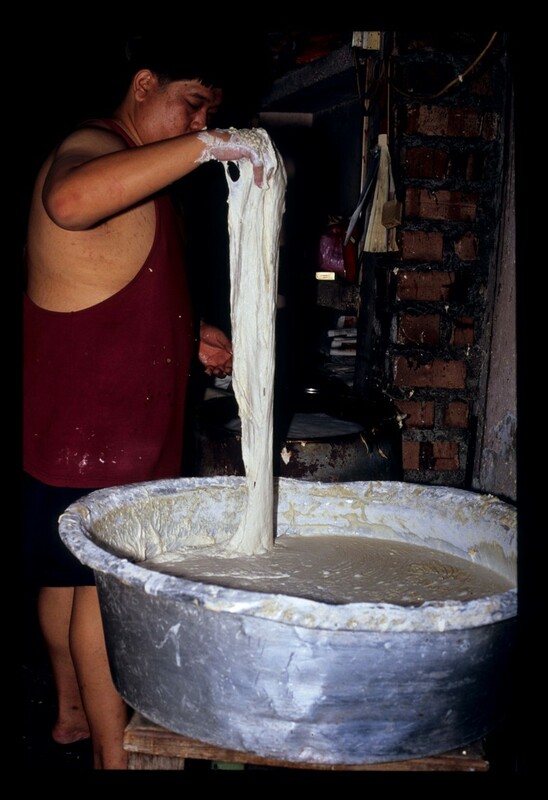 So he makes his own, everyday, from rice flour and water. If, when the curry pot runs dry, there's noodles left in the display case, they're thrown out. Serve day-old loh see fun? Over his dead body. Finally, well after six in the evening, Steven and Oiling steal a few hours to relax. Steven and his fellow vendors have been prepping in the milky glow of Hong Seng's outdoor bulbs. At 6:20am the scrape of plastic chair legs and the grate of metal shutters signals the start of the business day. Hushed toil is replaced by the hum of commerce. Early-bird customers trickle in, place breakfast orders, and retreat to their tables with the paper and a pot of tea. Car doors slam as passengers jump out to ta pao (take-away). A Rapid KL bus rumbles at the stop in front of the shop. 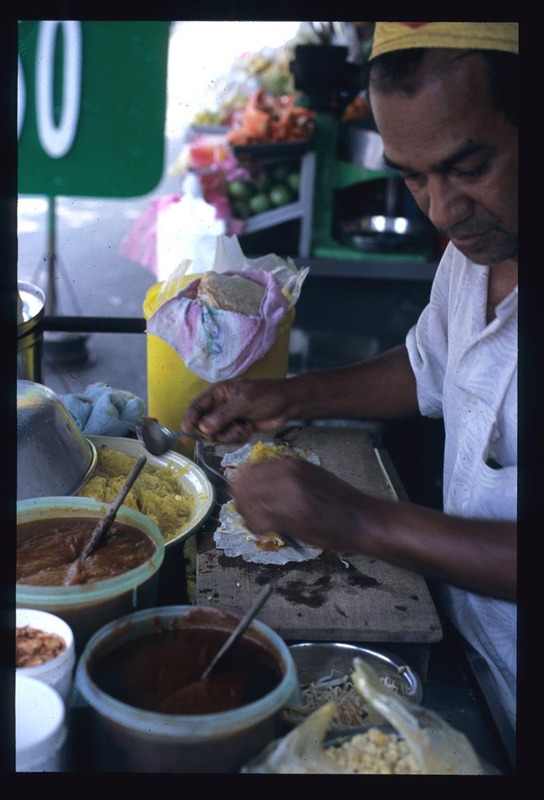 As the scent of curry leaves envelops Steven's stall like a warm hug, business comes in fits and starts. There's take-away for eight, then nothing, then more take-aways and service for a table of five. So it goes until ten-ish when, as Steven says, the 'real rush' begins. From now until closing it will be a full court press. He and Oiling, outfitted in Nike trainers, jog pants, and polo shirts, are ready for action. As the orders pile up they and their helper perform a well-rehearsed dance, seamlessly negotiating each other on the small patch of tile behind their stall. Then, the last of the curry is sold. The frenzy ceases and clean-up begins. Oiling smiles. Steven, chatting with a regular, lifts his basebal cap and mops his brow. Eight hours down, seven to go. Two hours - that's not how long these particular mee goreng (fried noodles) take to prepare, but the amount of time you'll need to spend in the car (assuming you're starting from Kuala Lumpur) to sample a plateful. 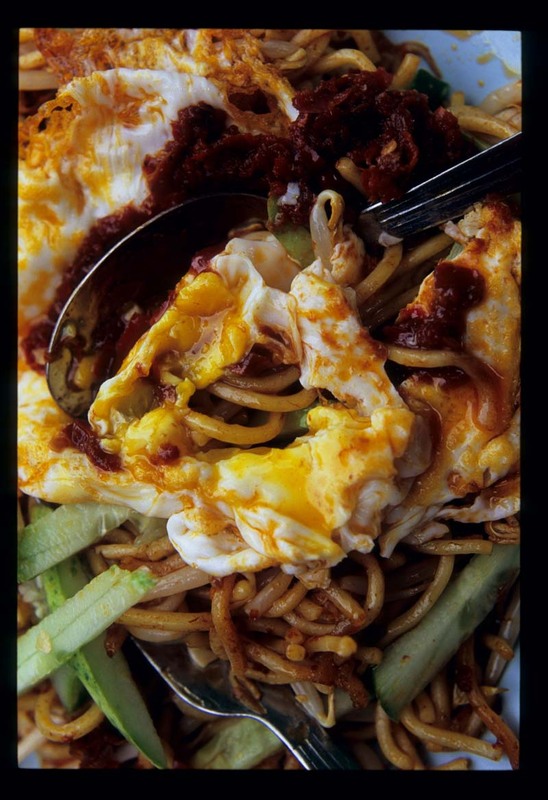 Drive all the way to Malacca just for a [yawn] been-there-done-that dish like mee goreng? If the dish in question is Hassan's, I'd consider it. Hassan's shack sits about a kilometer outside of Malacca's 'old town', kitty corner to the decaying Pacific Inn Hotel. Business is ripping early on a Sunday morning. We're forced to wait good and long for a seat, with nothing to do but take in the scent wafting from the 'kitchen' and hungrily eye the plates of noodles that top every table in multiples. What's the draw here? Nothing special, just yellow noodles and bean sprouts fried together in an arm's-width sized wok. Hassan literally throws himself into his work, weilding spatulas in both hands and calling into play every shoulder muscle to dig in deep, lift, and toss. When you arrive at Hassan's head straight for the egg queue. It's long, but moves at a brisk pace. 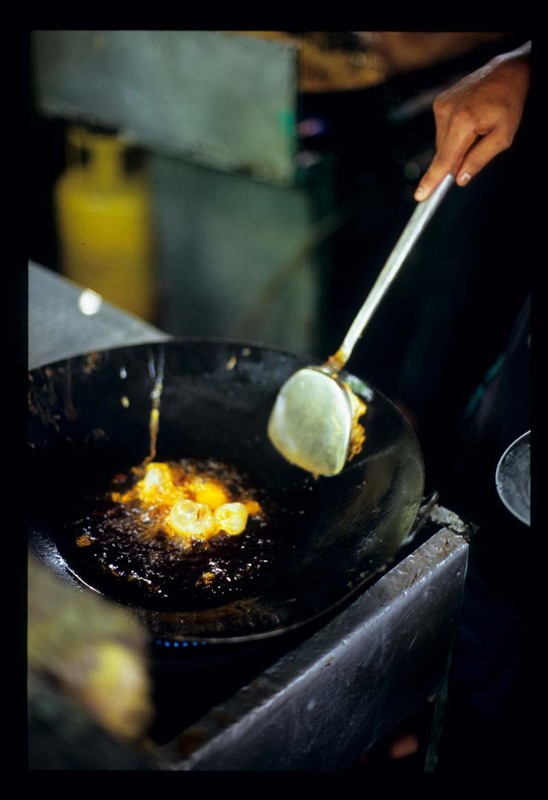 Hassan's eggs are fried one or two at a time, in redder-than-red chili oil. As you arrive at the front of the line a plate is sent sliding across the counter in your direction. Now it's time to customize, albeit within fairly narrow parameters. 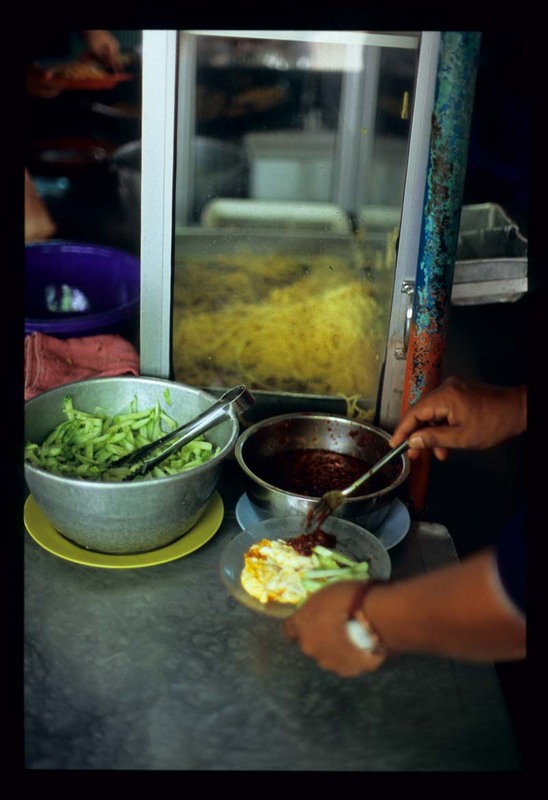 Tong up a smidge or a pile of thick-cut cucumber sticks and fork up two blobs of sambal. On second thought, better make that five blobs - Hassan is known far and wide for his robust sambal. Now, head for your seat and wait for the main to arrive. Try not to dig right into the egg before your noodles even hit the table. When they do, take a second to admire their pristine nature - find no sauce, no meat or prawns or other extraneous bits of this or that, only fire-kissed noodles and surprisingly perky sprouts. Now, grab your egg plate and tilt, allowing the whole chili grease-slicked lot, cucumbers and sambal and all, to slide onto its noodle bed. 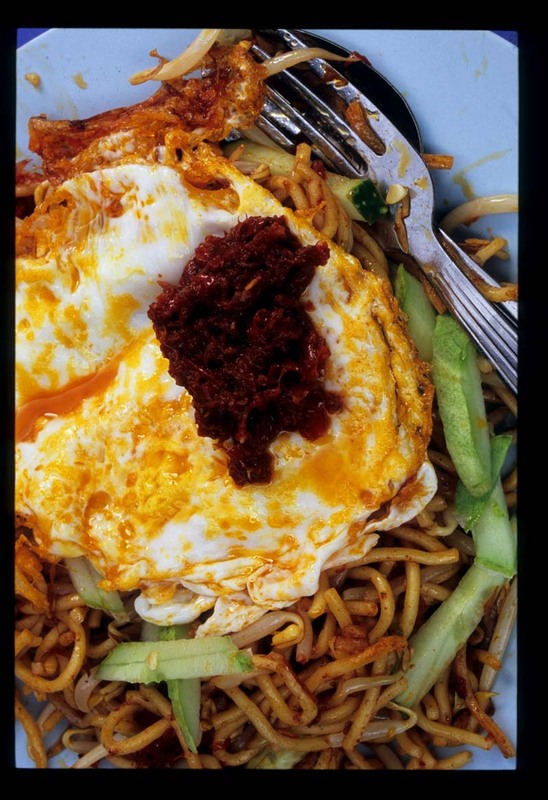 Break the yoke (unless you've specified otherwise your egg will be sunny-side up, boasting a lovely, runny middle) and mix in sambal to create the beautiful mess-on-a-plate that opens this post. Dig in. Note that the egg's edges have gone paper-thin and lusciously crispy, and that Hassan's sambal is belacan free, all smoky chili heat that starts slow but builds to a wonderfully tongue-throbbing inferno. The noodles are sublime, the chili-oil lashed egg even more so. But it's mostly about the sambal. The chili-phobic will find no joy at Hassan's. Nudge the last morsels onto your spoon, and follow with a cooling hit of beverage. Then, reluctantly, relinquish your seat and walk away, harboring more than a bit of uncharitable envy towards those who took your place. The high point of your day is over, while they still have a plate (or two) of Hassan's mee goreng to look forward to. Hassan's Mee Goreng, Jalan Tengkera (kitty-corner to Pacific Inn Hotel), Malacca. 8am-11ish, or until supplies run out. Closed on Friday. 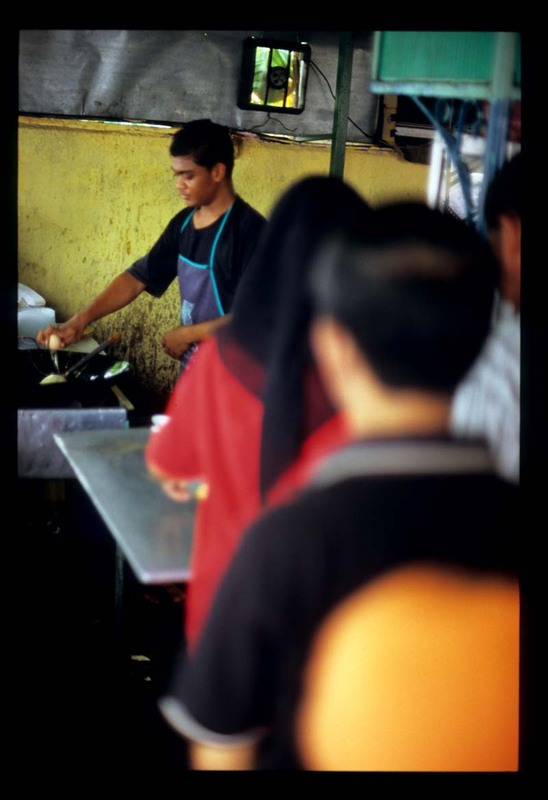 Hassan also sells nasi lemak (with the infamous sambal) but we just can't imagine ever getting past the mee goreng. 'Penang is really more Hokkien than Nyonya.' Not a surprising observation, coming as it did from a Penang-born Hokkien Chinese Malaysian. But not one you'll find in most guidebooks. 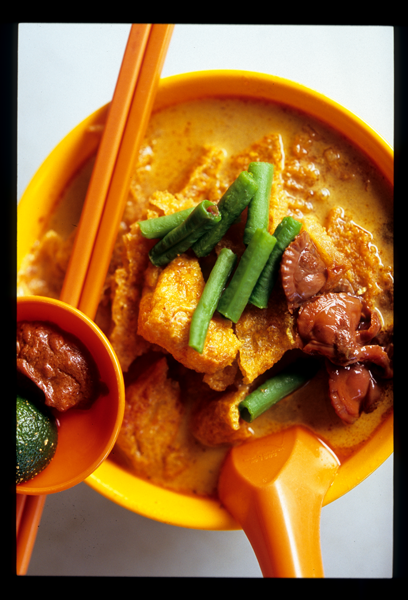 When food-oriented travelers think 'Penang' (if they think of it at all) they think 'nyonya food'. Nyonya (also spelled 'nonya') are the female descendents of Chinese immigrants who, centuries ago, settled in Penang, Malacca, and Singapore (and Sumatra) and inter-married with locals and adopted local customs ('baba' are their male counterparts). Nyonya cuisine is likewise a marriage, of Chinese and Malay (and a bit of Indian, in Malacca) ingredients and techniques. In actuality nyonya food is not thick on the ground in Penang. 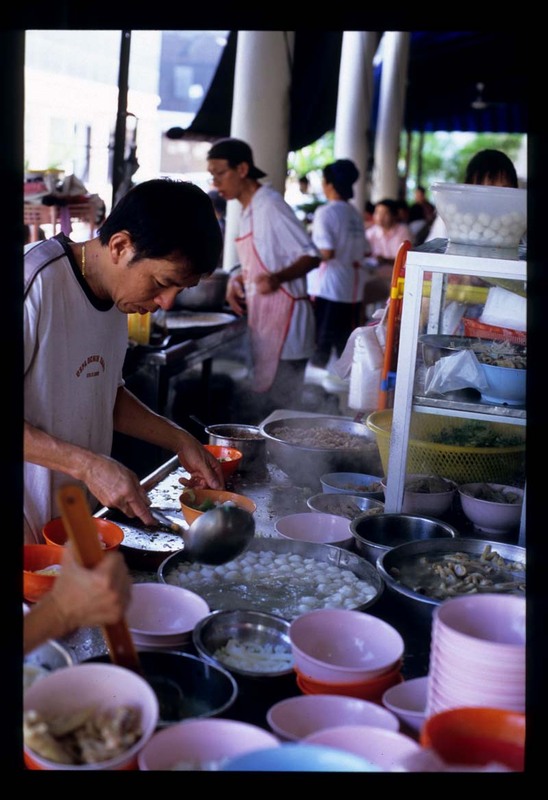 There are a couple nyonya hawker specialties but few nyonya restaurants - which most locals wouldn't bother with anyway, believing that dishes as time-consuming and laborious to make as those claimed by the nyonya are best left to home cooks and better eaten in private residences. 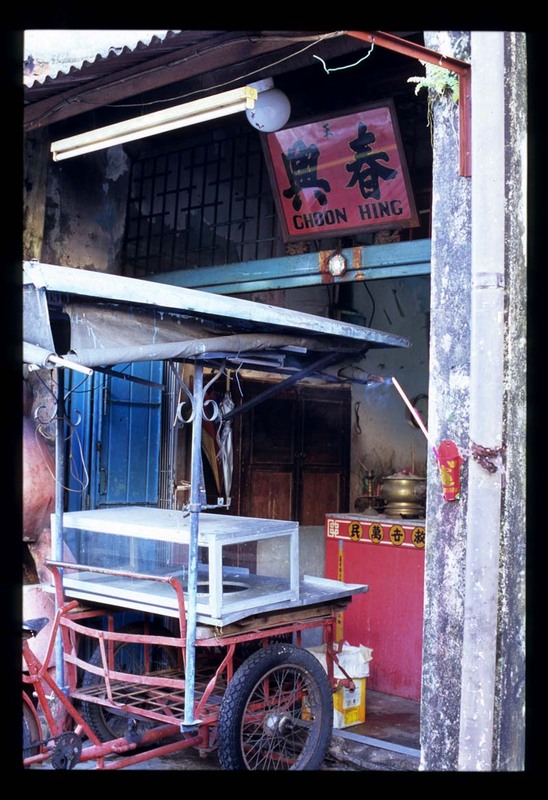 What is plentiful in Penang is Chinese-origin hawker food. 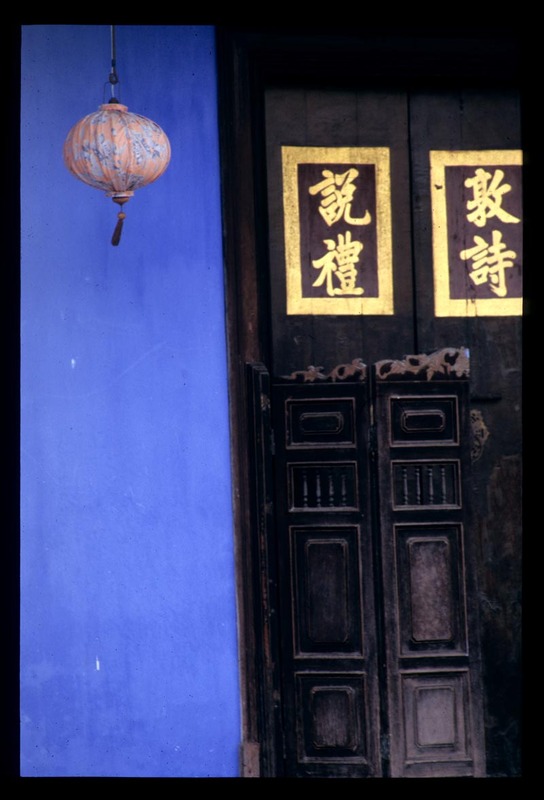 Penang's population, unusually for Malaysia, is mostly Chinese, and the Chinese immigrants who settled in Penang so many years ago came mostly from the southern coastal province of Fujian. 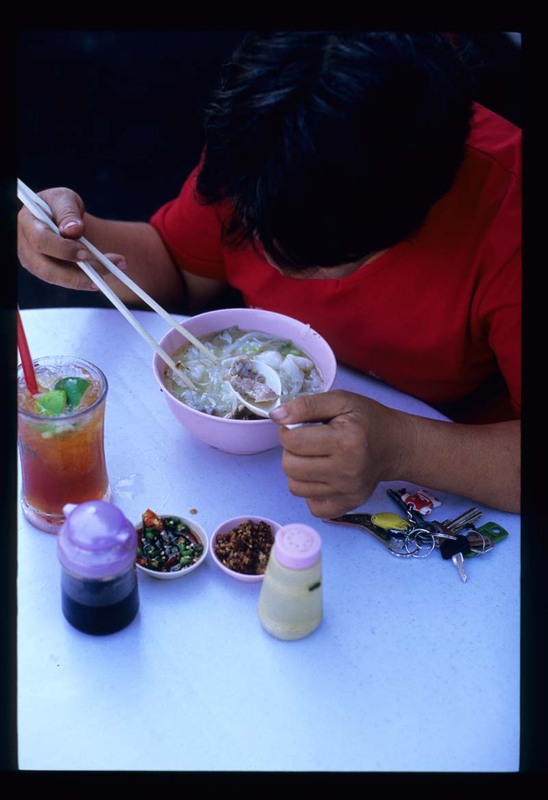 Which brings us back to the assertion that in Penang, Hokkien food rules. 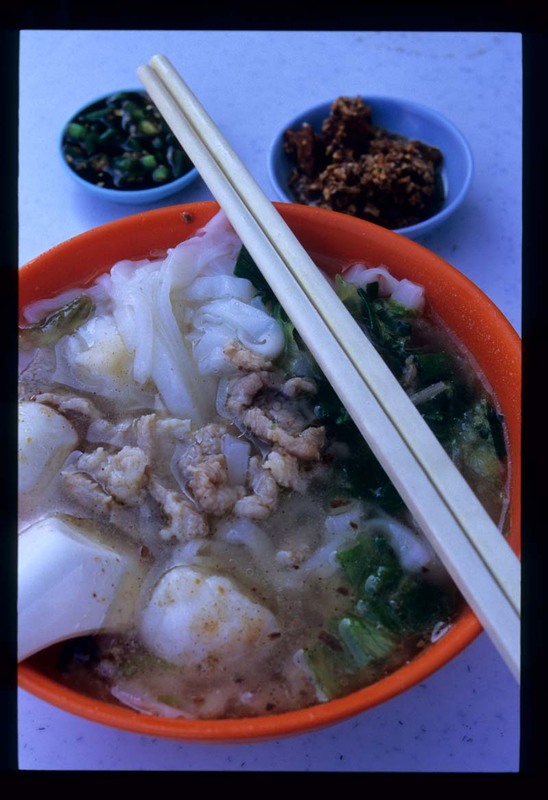 Koay teow th'ng Penang's iconic dish? Not assam laksa? Or rojak? Nor nasi kandar? I was intrigued. Which is how Dave and I ended up, early on a Saturday morning, hanging our heads over steaming bowls at Penang's Fook Cheow Cafe. Koay teow th'ng sounds dull. 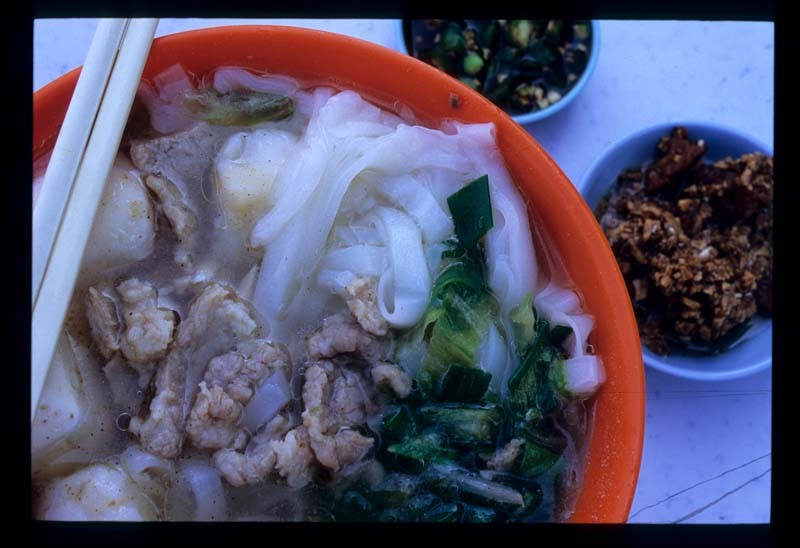 It's just flat, wide rice noodles (koay teow, better known for their starring role in stir-fried char koay teow) in a clear soup (th'ng = soup; 'tang' in Mandarin). 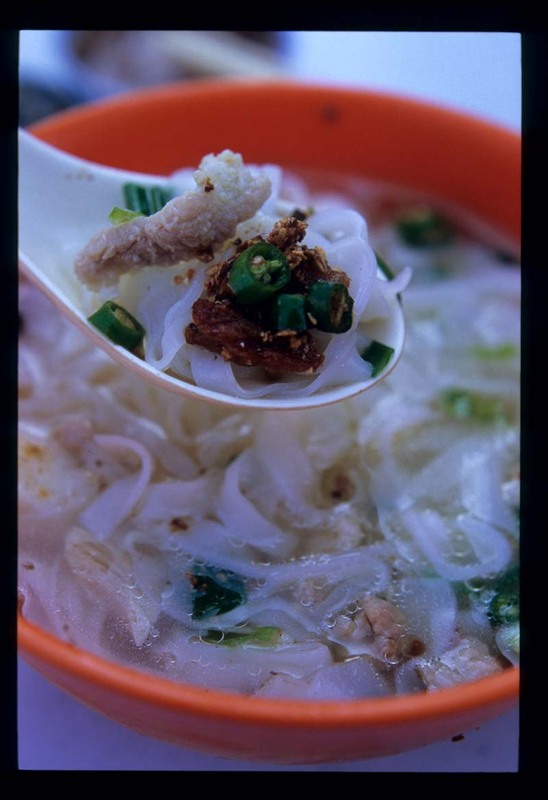 Many of Penang's koay teow th'ng stalls serve a duck version, but the stall at Fook Cheow sticks with basic pork. Ordering a 'complete' brings a bowl brimming with - in addition to noodles, stock, lettuce, and pork slices - pork innards, blood jelly, chicken feet, and fishballs. This I learned too late; since I didn't specify otherwise my bowlful turned out to be a foreigner-friendly version, with only fishballs in addition to pork meat (I'll know better next time). What's special about this dish are the impossibly silky yet toothsome noodles, the deep, rich meat stock, and the garnish that makes koay teow th'ng what it is: chopped garlic and crackling fried to a caramel-ish crunch. The folks working the stall add a spoonful to every order, but those in the know make a beeline for a metal bucket of the stuff perched at the front edge of the prep counter. Observation tells me that, when filling one's saucer, it is perfectly acceptable to fish around a bit in search of those extra few pieces of crackling. Our tablemate, a Saturday regular who, unsurprisingly, labels this stall's koay teow th'ng Penang's finest, showed us how to maximize the koay teow th'ng experience. Sip the soup separately, she advised, and don't dump the crackling-garlic mix directly into the bowl. Instead, chopstick up a few noodles and carefully arrange them in the bottom of your soup spoon. Place atop this koay teow pillow a fishball (obviously hand-formed, fresh and fishy, light but with a bit of bounce) or some meat (or blood, or stomach or liver). Add plenty of garlic and a crackling or two and, finally, a soy-soaked piece of chili or three. Bring spoon to mouth and marvel at the range of textures and tastes that one simple soup noodle can deliver. 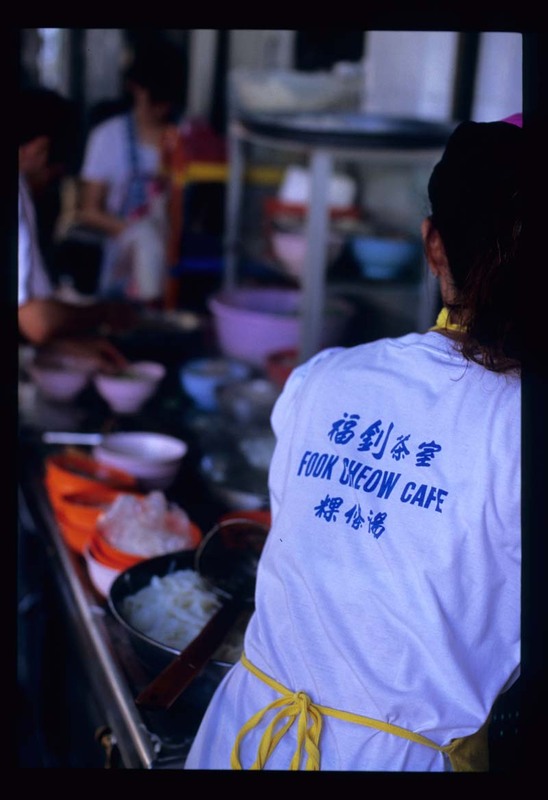 Koay teow th'ng stall at Fook Cheow Cafe, Lorong Amoy, Penang. Early morning till they run out. This is not a Fear Factor-esque tale of a foreign woman who, conquering her disgust for the notoriously foul-smelling Asian fruit, puts a piece in her mouth and, fighting back the urge to gag, forces herself to swallow it. It's just a story about eating durian, and liking it. It's not always been so. Twelve years ago, in Thailand, I tried durian - vile. I could barely get past the stench to taste the fruit. Five years ago, after we'd moved to Bangkok, I tried again. Revolting still. I let the durian be. Then, a couple of weeks ago Dave suggested, 'Let's go get some durian.' We were in Penang, and had just finished our umpteenth meal of the day. I was in a high-blood sugar haze, feeling mellow and agreeable. Besides, it's the season. I gave him the thumbs-up. We headed to a stretch of McAllister street that features a number of durian stalls equipped with tables and chairs for on-site consumption. Dave, drawing on experience gained last year when he and Malaysian colleagues had indulged in a durian binge at the very same stall, asked for a 'buttery, milky' specimen. The vendor nodded and shook two or three fruits before settling on one and cutting it open. I picked up a piece and put it to my mouth, mildy surprised that the smell didn't put me off in the least. It was buttery, like the ripest, oiliest avocado mashed to the smoothest paste. I tasted a hint of butterscotch, a smidge of avocado, lots of sweetness, and something stronger, unidentifiable but not unpleasant. I kept eating, and liking it, and finished my share with no prodding from Dave. We chased our durian with a bunch of mangosteen, purchased at the same stall. 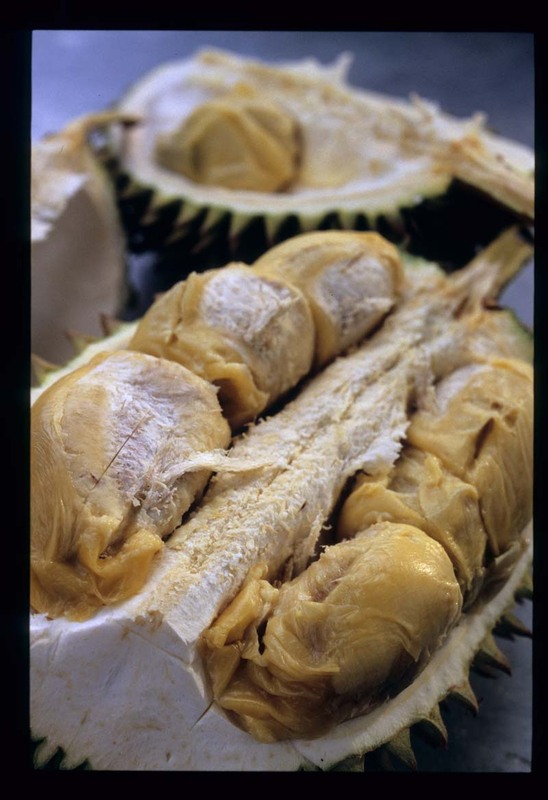 Durian is considered a 'heaty' fruit and so it should be followed with something cooling to the body. Mangosteen fits the bill. The 'king' of fruits is eaten with the 'queen'. I've been thinking about that durian, and wondering what accounts for my conversion. Maybe it's location, location, location. Malaysians - unsurprisingly - claim that Thai durian is inferior to the local stuff. The problem, I've heard, is that in Thailand durian is often picked unripe when, ideally, it shouldn't be harvested till it drops from the tree. Or perhaps it's down to variety - some are said to taste more 'fermented' than others. It could be that our durian seller gifted us with an extra delicious, minimally stinky one. It might well be that my next durian foray won't be as successful. It probably has much to do with palate. Mine has broadened significantly over the last decade, as many (but not all) palates do when regularly challenged with new flavors. I've become quite enamored of pungent, 'stinky' foods, bplaa raa, sambal belacan, salted fish, and the like. 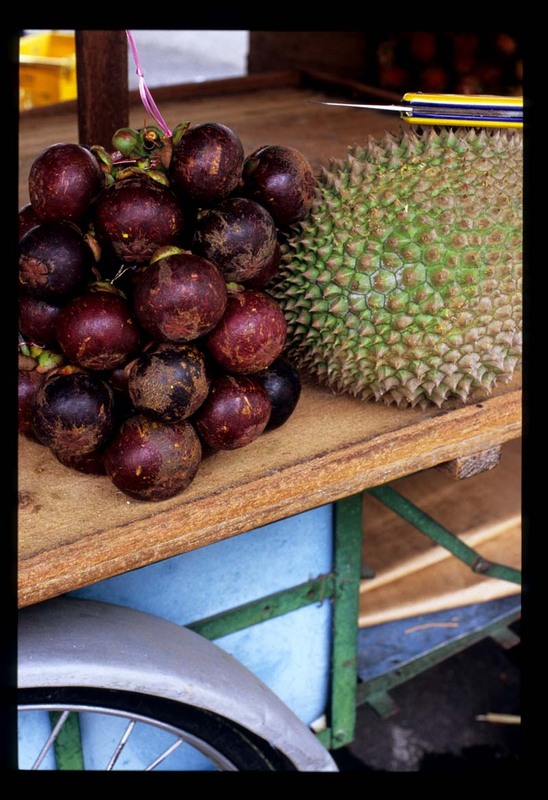 I also suspect that the general disdain for durian - among many foreigners (to southeast Asia), that is - might be rooted in our expectations of what fruit (tropical fruit especially) should be. Durian isn't refreshing in the least. It's not crunchy or juicy or appealingly fragrant. I wouldn't want it for breakfast, and certainly not after a full dinner. When it comes to fruits durian is in a class all its own. My taste buds say it has more in common with a pungent cheese than with a pineapple or a mango. 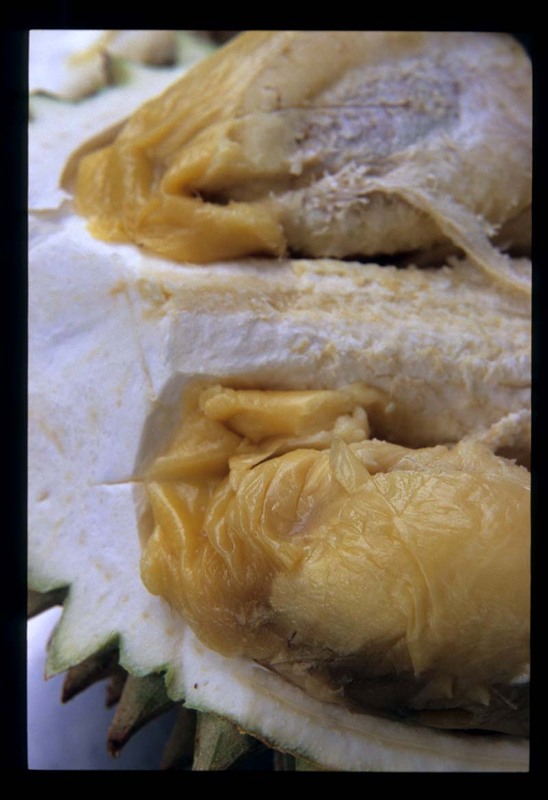 And many of 'us' foreigners who can't stand durian do partake of odiferous dairy products that rely on the growth of molds to achieve their distinctive character. Something to chew on the next time a durian crosses your path. Try this: close your eyes, open your mouth, and think 'cheese'. Durian stalls along McAllister Road near the cross with Lorong Selamat (Penang) are open morning to night. Our durian and mangosteen cost about 20 or so ringgit. 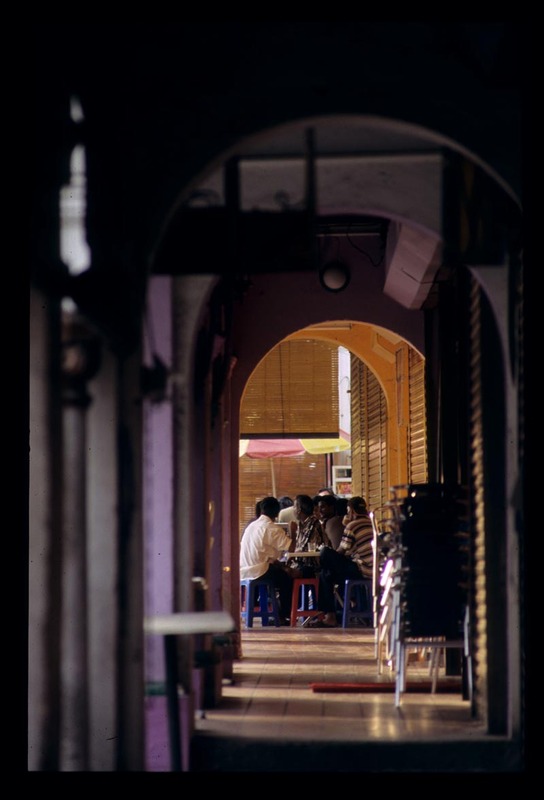 Malacca - the old 'downtown', that is, roughly bordered by the Malacca River, Kubu Road, Hereen Road, and First Cross Street - is fast disappearing. Just one road remains nearly untouched by the rampant development and careless neglect that, over the last decade, have erased much of Malacca's distinctive architectural character. 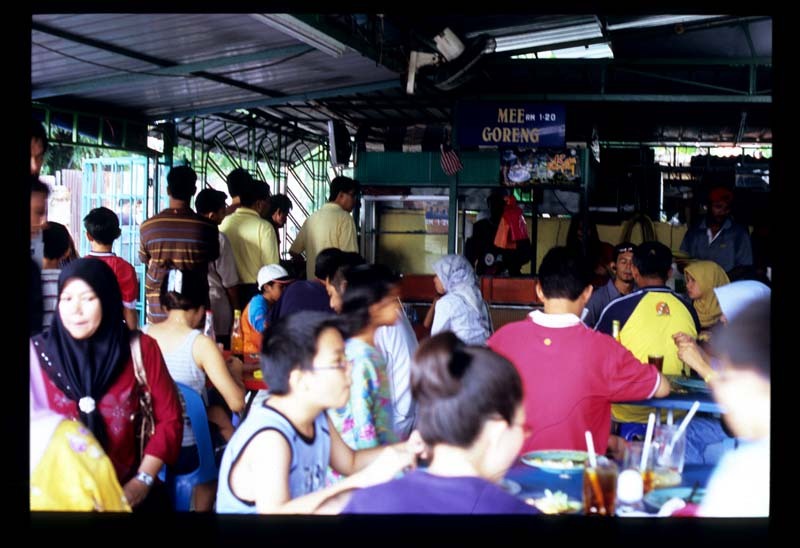 Jalan Kampong Kuli is named after the predominantly Chinese and Indian migrants ('coolies') who labored in the old colonial Settlement's harborside trading houses and go-downs (warehouses) and on the plantations on its fringes. And it is refreshingly devoid of guesthouses, bars, vegetarian cafes, shops peddling kitsch, and tatoo parlors. Instead, there's an old-fashioned barbershop anchoring Kampong Kuli at the corner of First Cross Street. 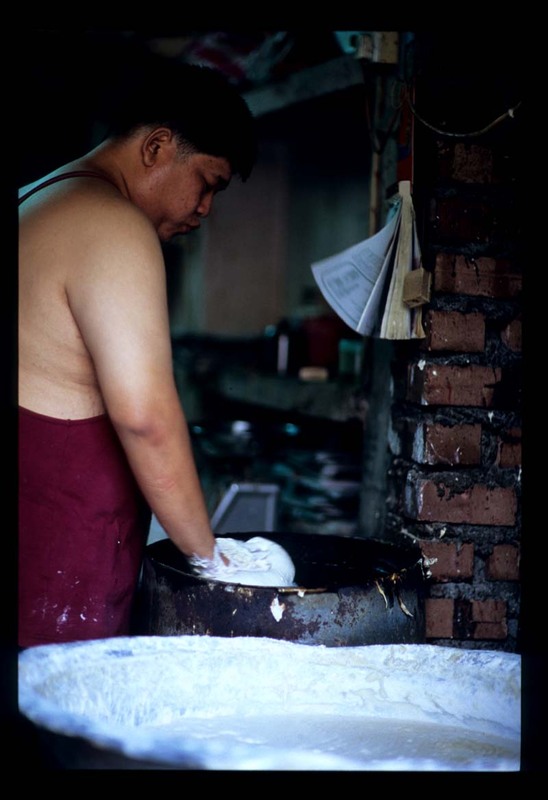 Halfway up the short block sits Kim Huat, a third-generation confectioner turning out red and yellow bean paste-filled buns. 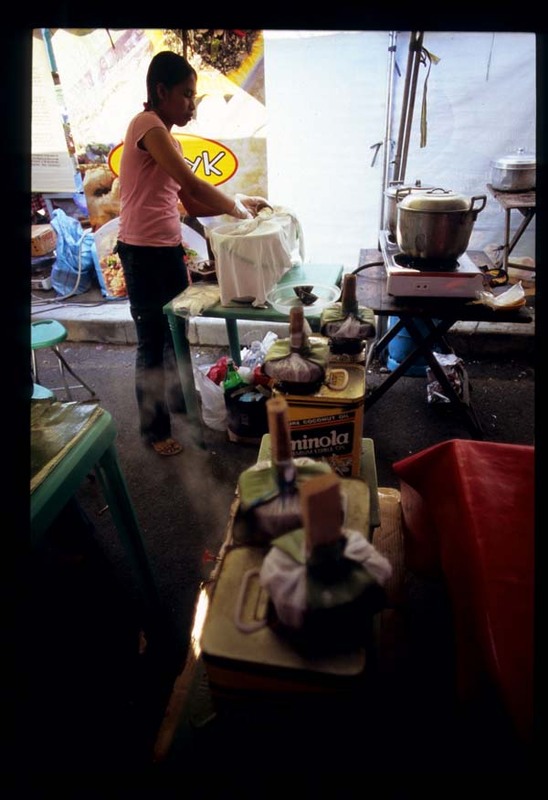 Kampong Kuli houses a goldsmith, an Indian caterer, a duck roaster, and a coffee corner. At Choon Hing - number 28 - popiah (spring roll) wrappers are made as they have been for decades. 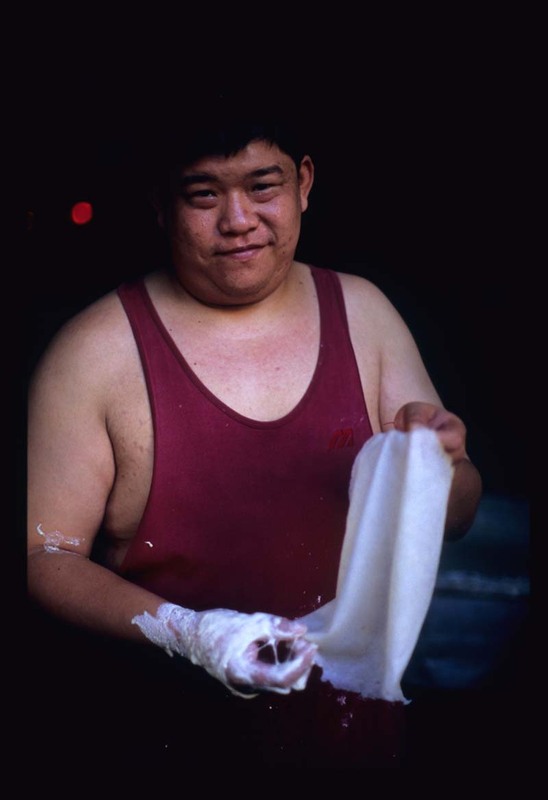 Just after dawn we find Ong, fourth-generation popiah skin maker, working the griddle at the front of his shop. The red glow of a Buddhist shrine illuminates the rear of the room and sticks of incense burn on a table at the front; just outside the door, more incense smokes from wall shrine. Ong has been at it since three, when he rose to mix the dough for his wrappers. He makes wrappers for popiah sellers in town, and also for his own family's popiah business. When he's finished working here, around 11, he'll head to his own popiah stall at the newish Singapore-style Newton Food Court. Ong's father sold popiah for years in front of Madam King's Department Store. The Fatman, as he was known to customers, was famous for his fabulously oppulent spring rolls. Ong's brother took over the Jalan Bunga Raya stall when their father passed away about a year and a half ago. It's not easy work, transforming liters of dough into thousands of paper-thin wrappers. Ong's been doing it so long that the distraction of two strangers asking a lot of stupid questions don't slow his pace a bit. A metal tub of thick wheat flour dough sits to his right on a low wooden table. 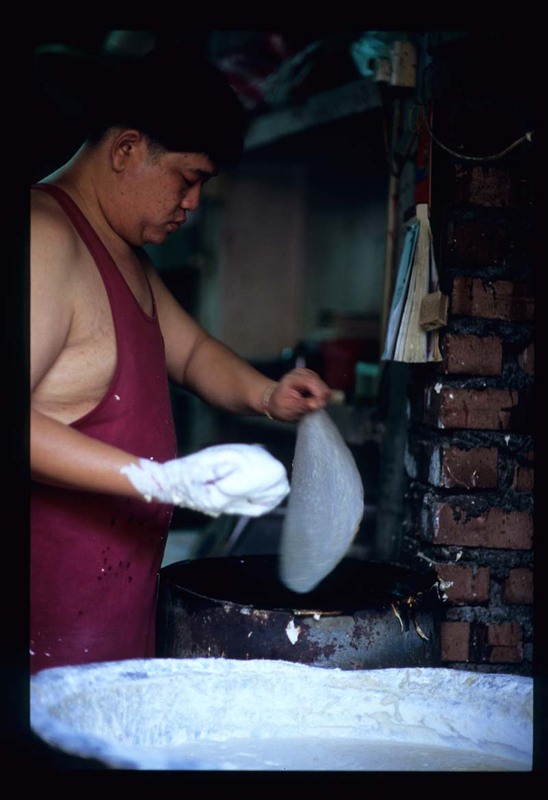 Ong dips his hand in deep and pulls up a heavy rope of dough, flipping it on top of itself to form a patty in his palm. Ong lays the dough patty on the hot griddle's, applying pressure at the outset. 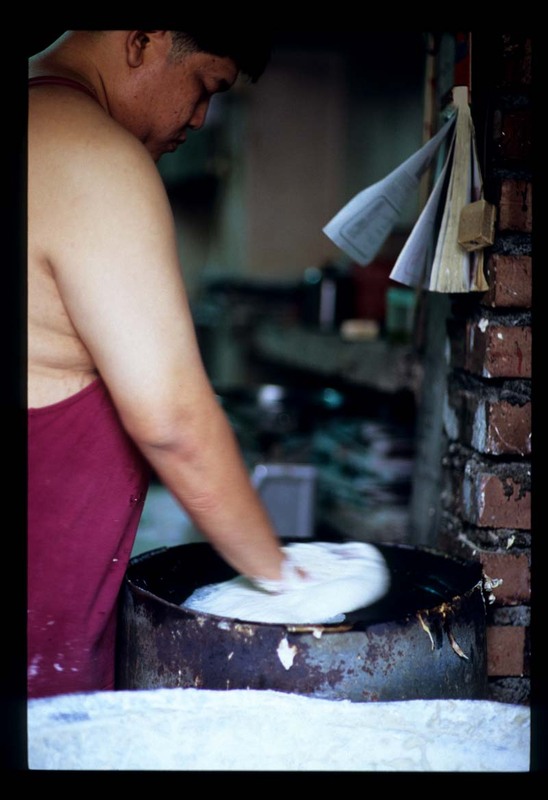 He quickly backs off and then quickly skims ing the dough over the griddle's surface in a clockwise direction before pulling it away to leave the barest film. 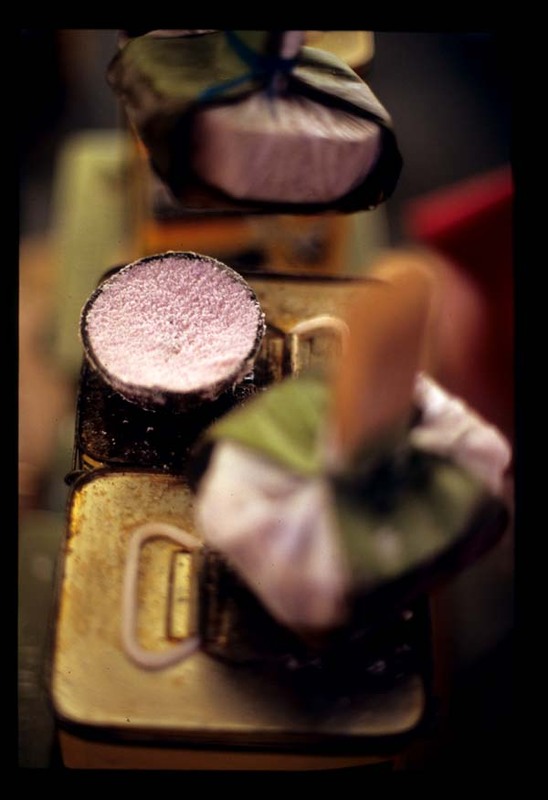 and then Ong pulls the wrapper off the griddle and adds it to the stack to his left. 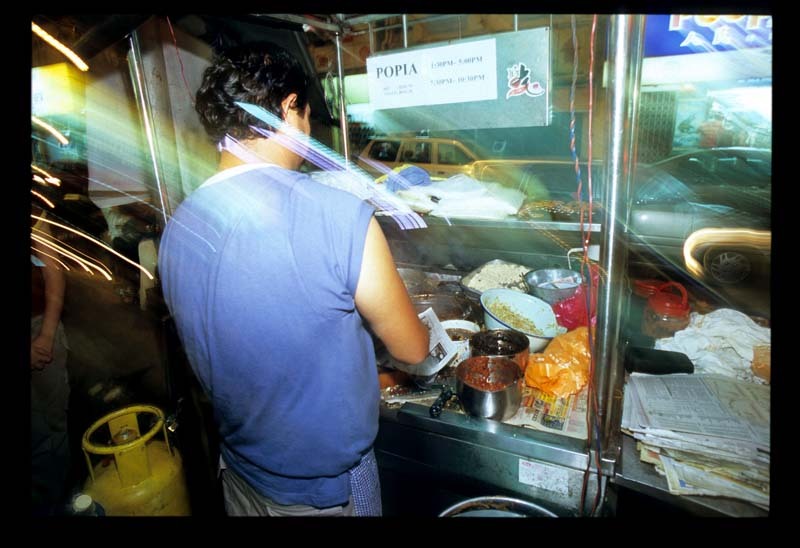 He gets six or eight popiah out of one handful of dough, then it's back to the vat for more. Lift, flip, coat griddle, repeat. How many popiah skins does Ong make in a single morning, we wonder. 'I have no idea,' he chuckles. 'I sell the wrappers by weight,' and he certainly doesn't count as he works. Days off are rare. Even if Ong and his brother wanted risk the wrath of regular customers by taking a break from their stalls, he'd be letting down too many other popiah sellers who depend on him for their wrappers. He invites us to visit him at his stall at Newton Food Court. 'Come try my popiah,' he urges. Brotherly competition may have initiated the invite. 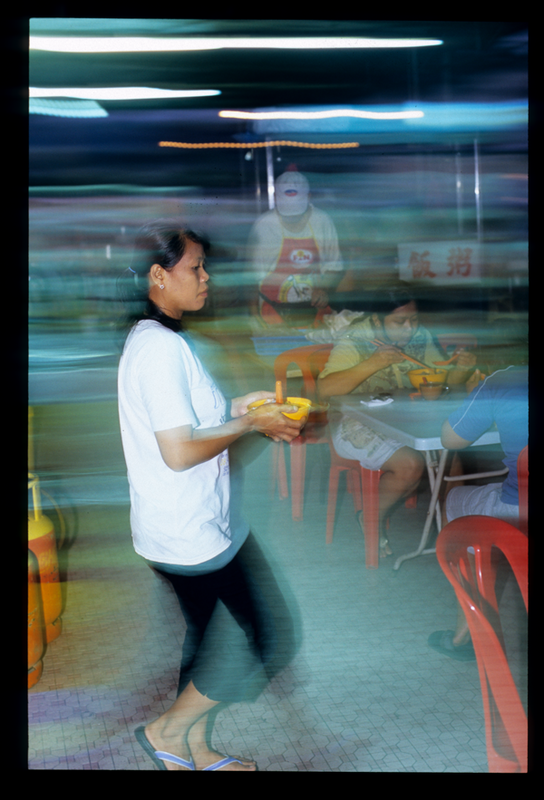 We've told Ong that the night before we queued for what seemed like hours at his brother's stall, as customers in front of us purchased popiah by the dozen. We also raved about the final product. 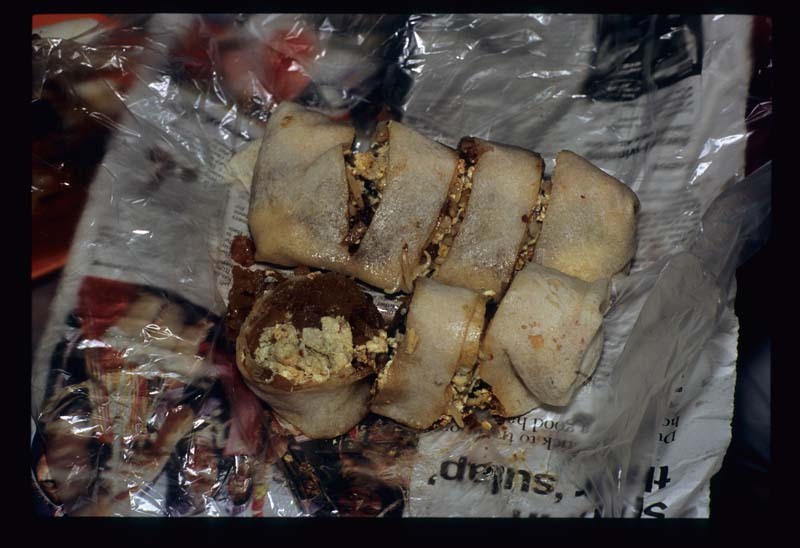 'Fatman Popiah" (as the stall is still known, even though the original Fatman has passed on and his son's girth doesn't approach the legendary hugeness of his father's) makes liberal use of a not-so-secret secret ingredient: lard. 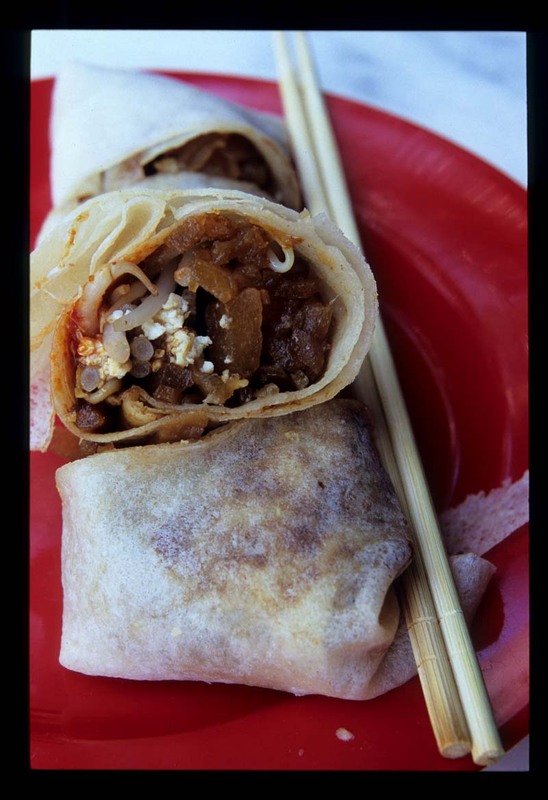 Son of Fatman's popiah contain the usual tender cooked yambean (jicama), bean sprouts, and egg, and are slathered with chili and sweet sauces. They're also generously studded with crispy bits of crackling and drizzled with more than a bit of lard oil. Simply put, they are incredible, worth every lardy calorie. We understand the queue. These taste of these popiah justify the wait. Ong's popiah, served from his food court stall, are a bit more refined. He uses lard oil, but not too much. His popiah's filling doesn't messily spill out of the wrapper, as his brother's does. Son of Fatman's popiah win for sheer gross indulgence value. If you love pork, you love lard (you just might not know it). And if you love lard, Son of Fatman's popiah are right up there with a perfect plate of char kuey teow. But we're partial to Ong's version. The filling is balanced, the lard and cracklings pronounced but not overwhelming. And the wrappers are fresh and soft and decidedly wheaty, a delicious treat in and of themselves. 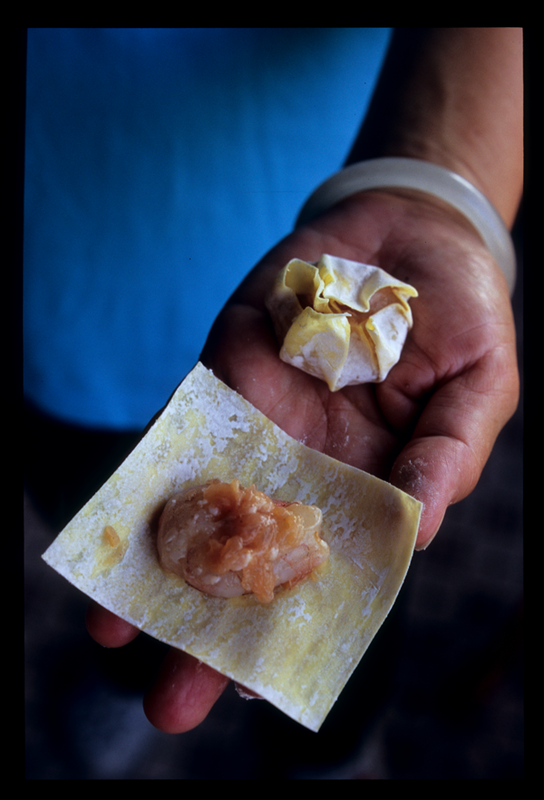 Besides, these are the popiah made with the hands of the popiah skin maker. Ong's popiah stall, Newton Food Court (across from Makhota Parade Shopping Center), 11am till late evening. Fatman Popiah, Jalan Bunga Raya just in front of Madam King's Department Store, 5-ish till he sells out late. After an early start from Manila and a morning spent documenting the fish whisperers at the Cavite City (Philippines) market we were famished. Our host Rody wanted to show us the seaside house he'd grown up in and then, he said, we'd swing by his sister Lydia's house for lunch. 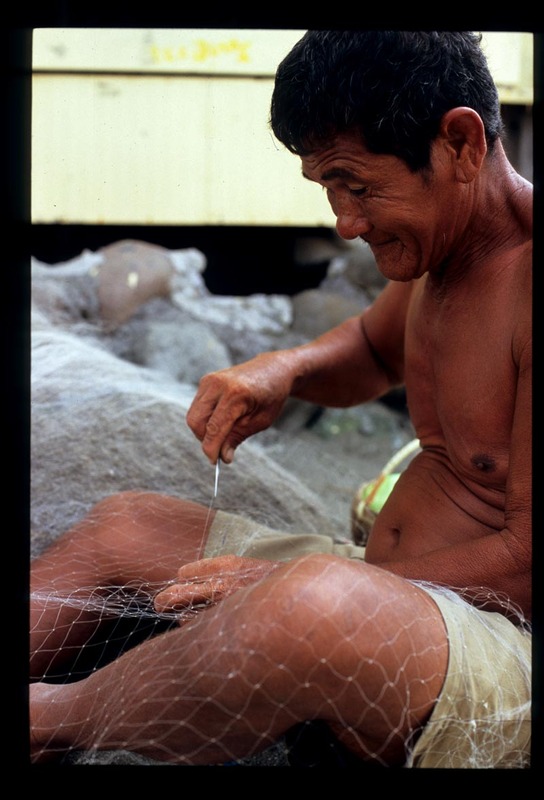 The beach in front of Rody's childhood abode was quiet, just a few kids and a lone fisherman mending his nets. It was high noon and the sun scorched the backs of our necks, so we didn't linger. Besides, our mid-day meal was waiting. At the market, under the pandawan (where the fish whisperers whisper), Rody introduced us to Lydia's husband, who was toting a couple of bags of goodies fresh from the sea. Cavitenos take the sea's bounty for granted - almost every meal includes fish or shellfish, Rody told us. Lunch was simple - two dishes to eat with rice and sublime child fist-sized 'baby' mangoes - and wonderful. The most interesting dish featured itsy-bitsy shrimp - what we Americans (anyone else?) think of as krill, whale food. In Southeast Asia, of course, shrimp this size aren't left to the sea creatures. They're dried and sold as is, fermented into cincalok and Philippine bagoong alamang (Lydia makes her own bagoong at home), processed into shrimp paste - and bought by the kilo to cook with. Lydia had sauteed the shrimp with tomatoes, onions, garlic, and patis (Philippine fish sauce). She cooked them for only a short while, so that they still sang of the sea and its natural saltiness. The tomato lent a bit of tartness. Dave's spoon kept straying back to the platter for just one more taste, and then another... We wondered why more of the world doesn't eat krill. 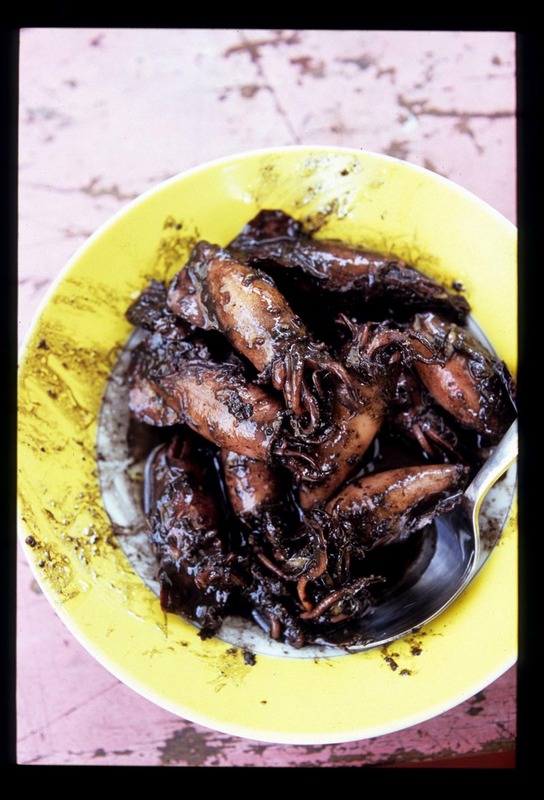 As luscious as the shrimp were, it was Lydia's squid adobo that really knocked our socks off. 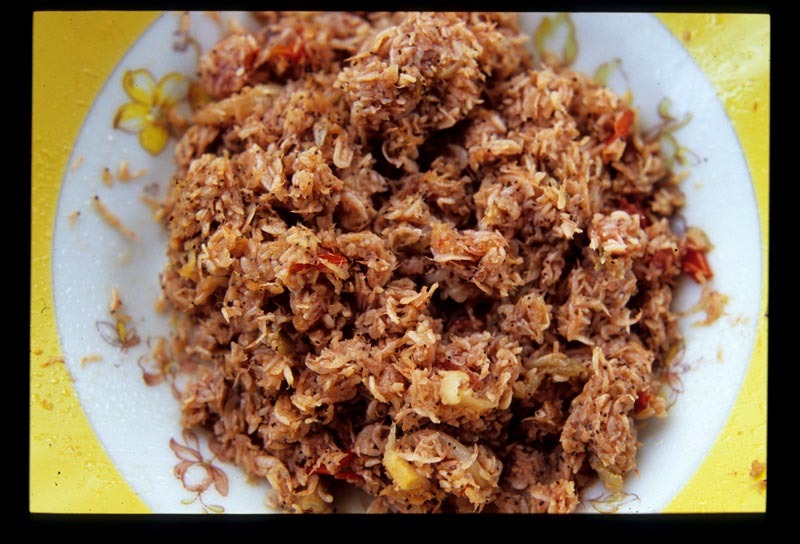 Rody confided that every time he visits his sister he crosses his fingers that she'll have cooked up a big batch of squid adobo, enough so that he can eat a plate full at her house and then carry home more when he leaves. 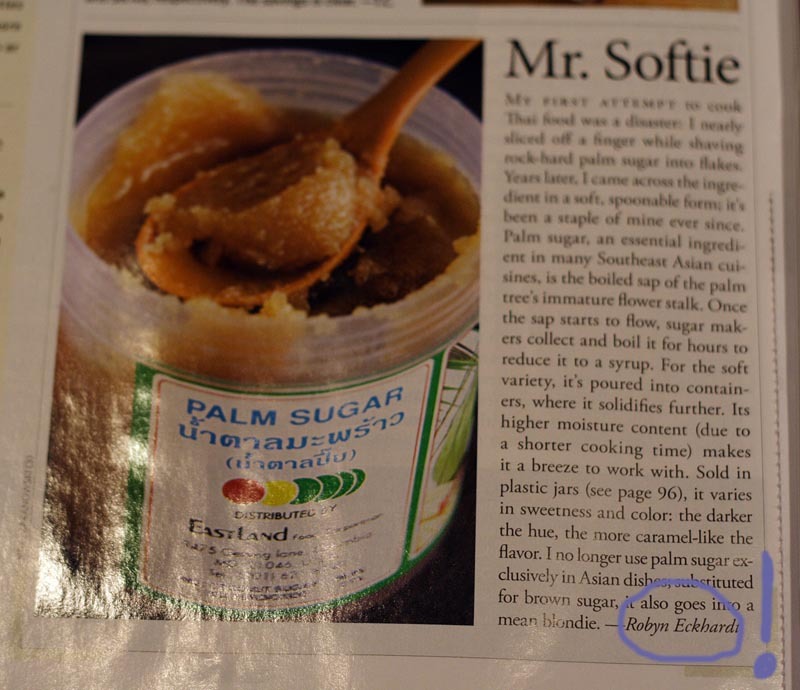 'Lydia is known for her squid adobo,' he told us with a grin. Boy, do we understand why. Adobo is a stewed-in-vinegar Philippine dish most associated with pork. The best adobo is the simplest and most straightforward. To make her adobo Lydia starts with squid no bigger than my thumb, just a little over two inches. She cleans them extra carefully to preserve the ink sac, then stuffs the sac and the tentacles inside the whole squid. After heating them slowly in a dry frying pan to draw out excess water she stews them in vinegar with garlic and a pinch of ground pepper added. In total the squid are cooked about 35-45 minutes, long enough to thoroughly tenderize them. Lydia's adobo is one of the best squid preparations we've ever eaten. Stuffing the tentacles inside the body of the squid made for a great textural contrast as we bit down through softness into chewiness. The vinegar was pronounced, but not overwhelming, and the garlic added a bit of 'ooomph'. This was among the finest of the taste memories we took away from our first stay in the Philippines. Later that day Cora, Rody's wife, told us that Cavitenos are known for 'pakiki sama' - treating strangers as friends. Indeed. Whenever I've been in the mood to attempt to duplicate Lydia's dish tiny squid haven't been available in the market, so I can't vouch for the accuracy of this recipe that Lydia recited to me. Still, if small squid are available to you (I wouldn't try it with large squid but then again, you never know), give it a try. Lydia uses Philippine cane vinegar. Plain white vinegar would be too harsh for this dish, but Japanese rice vinegar might work well. She says the dish may be served warm to hot, but that it improves after standing for a bit. 1. Stuff each squid body with tentacles and an ink sac. Place the squid in a frying pan large enough to hold them in a single layer. Turn the heat to low and allow the squid to release their retained water. Discard the water. 2. Place the squid over medium heat, add vinegar to almost cover them. Add the garlic and pepper, bring the liquid to a boil, reduce it to a lively simmer, and cook the squid for 15-20 minutes. Pour off and reserve the vinegar. 3. Add small amount of cooking oil to the pan and fry the squid over medium heat until just touched with color. Pour the reserved vinegar back into the pan and cook until the squid are tender, about 10-15 mins. Remove the squid to a bowl, pour over the ink-vinegar sauce, and serve warm or at room temperature. 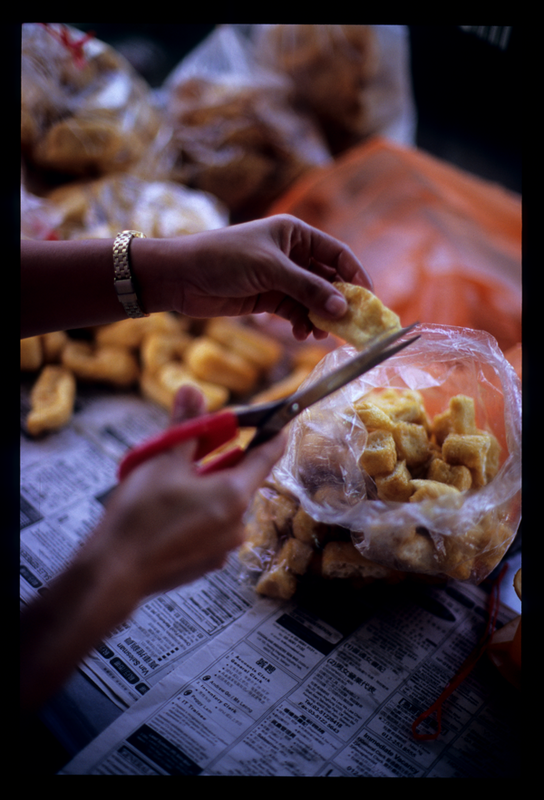 For a glimpse of what Dave's been up to head over here and scroll down to the June issue rundown for his full-page photo of tofu puffs being prepped for the curry pot. It appears in this month's KLue magazine (per usual, more of his photos accompany my monthly column on food culture in Kuala Lumpur and the Klang Valley). Forty-Two Hours: Wham, Bam, Thanks Penang! We just returned from a short stay in Penang. Although we can legitimately claim to have been 'on assignment' it may be that, in our quest to leave no gastronomic stone unturned, we went a bit overboard. To whit: between 6pm Friday and noon Sunday we downed Hokkien mee (prawn noodles), asam laksa, laksa lemak, lorbak, cendol, ais kacang, rojak, oh chien, pasembur, char kuey teow, and an unidentified jelly-ish sweet bathed in palm sugar syrup. And then, oh kuih, kerabu beehoon, mayong, putu mayam, putu piring, sotong kangkong, popiah number two (with crab meat), roti and curry, assorted Nyonya kuih, ketayap, apom balik and durian. We missed out on a targeted kerabu beehoon number two (the vendor was sold out within an hour of opening), and then finished with a large lunch at a seventy-plus year old Hainanese coffee shop where we ate, among other things, a remarkable pomfret gulai tumis. 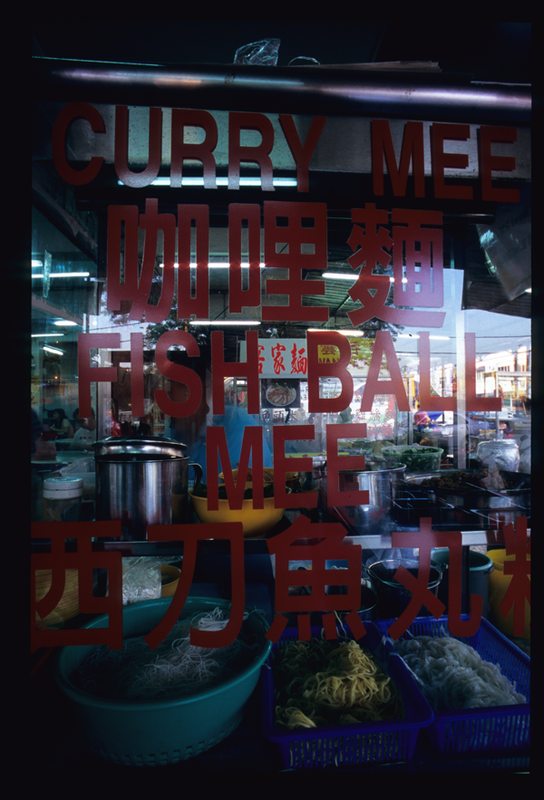 Amazingly, there are many Penang specialties that we did not have a chance (or the stomach) to try. But all in all, not bad for forty-two hours.